Have you ever wondered what would happen if you pulled together the views, intentions and experiences of over 1000 buy-side enterprises and the real deal industry view of all the FAO engagements to-date... AND THEN pulled this all together into a one hour festive feast of FAO that you can access for free on December 15th? Have you ever wondered what would happen if you pulled together a motley crew of Americans, Brits, Italians and some French-sounding chap, who claim to be the world's foremost experts in FAO? 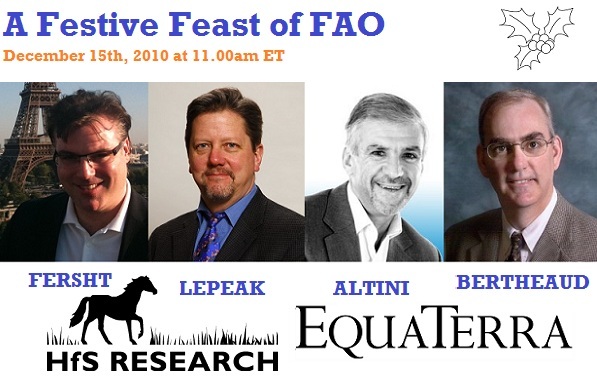 Stan Lepeak, Claudio Altini and Rick Bertheaud (see bios) will give you the low-down of best practices and insights from their client interactions, in addition to revealing some snippets from their brand new FAO service provider performance study. If you are interested in attending the webcast on 15th December at 11.00am Eastern Time, email Allison Norman with the subject header FAO webcast, and she'll set you up. Be quick to reserve your spot as places are limited.